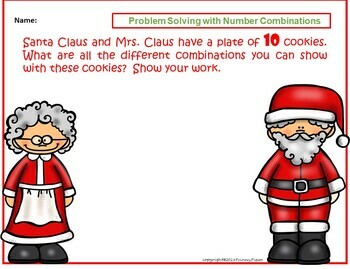 Before purchasing this set please note it is now included as part of a BUNDLE called December Math Christmas BUNDLE. Give your students real world problem solving practice with their Addition Number Combinations 3'-10's. 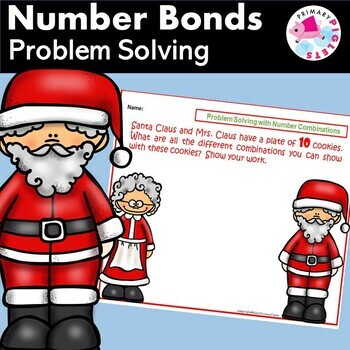 This set has problem solving pages for each number from 3-10, provided in B&W and color. Also a page with an open box for you to run a set and personalize the number each student may need to practice or be assessed on according to their levels. Each page provides an opportunity to use manipulatives to find the addition combinations. For example, on the 5's page, begin with 5 manipulatives atop one piggy, moving one at a time over to the other piggy while recording your number bonds on the page 5's= 5+0, 0+5, 1+4, 4+1, 3+2, 2+3. Follows Common Core. Visit my store, Primary Piglets for more fun products.